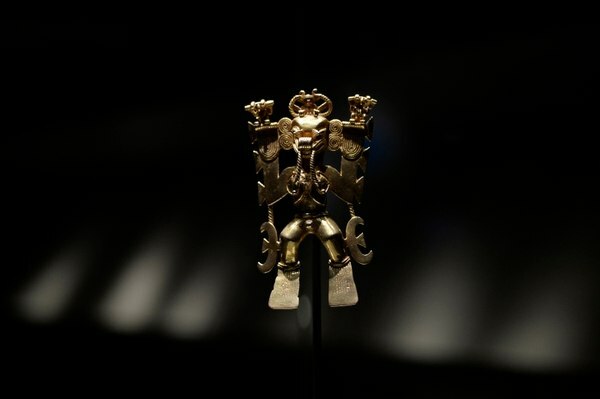 In the basement of the Plaza de la Cultura we find the Pre-Columbian Gold Museum that has recently added some outstanding pieces. These rare objects shed light on history of the indigenous people of Costa Rica. One of the new figures is a crab, not normally found among the gold pieces of the time. It represents the crab that is Sibú’s helper. Sibu, the creator, sent the crab to the land to give fresh water to the humans, according to legend. Another impressive piece shows a woman with a cranial deformation holding a baby with the same deformation. She is sitting on a stool reserved for high-ranking individuals. It’s made of clay which represents fertility. There is a piece that shows the superhuman characteristics of a great shaman. It also alludes to the close relationship between humans and animals in pre-Columbian life. The gold piece is very detailed. There are three animals as spirits on the head, frogs, a symbol of power, on the chest, and a bird’s head, the symbol of fertility, on the sexual organ. A golden spider that is a rattle tells the story of the native healers that used stones for healing. Their stones were no more than the spider’s eggs. The spider is said to have contributed to the construction of the world. The exhibition is open from 9:15 to 5 every day. Costa Ricans pay ¢2,000, students pay ¢500, foreigners pay $13, and foreign students pay $10.